Polystyrene Sheet Pack of 5 0.25mm Thick. Known as Styrene Board and can be used to build deck,superstuctures and fittings. Polystyrene Sheet Pack of 5 0.50mm Thick. Known as Styrene Board and can be used to build deck,superstuctures and fittings. 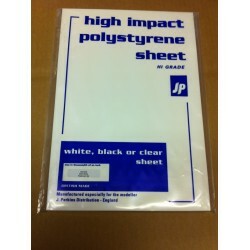 Polystyrene Sheet Pack of 5 0.75mm Thick. Known as Styrene Board and can be used to build deck,superstuctures and fittings. Polystyrene Sheet Pack of 5 1.00mm Thick. Known as Styrene Board and can be used to build deck,superstuctures and fittings. Polystyrene Sheet Pack of 5 1.50mm Thick. Known as Styrene Board and can be used to build deck,superstuctures and fittings. Polystyrene Sheet Pack of 5 2.00mm Thick. Known as Styrene Board and can be used to build deck,superstuctures and fittings.